and errands to run, when you had more time to enjoy life instead of running off to the next thing. books that we own. It also won’t specifically be about minimalism – we live in a 2400sf house, that does not scream minimalism to me. you can take in order to bring your stress level down, to decrease the amount of decision fatigue that we all feel every day. the next thing because that is what you usually do. there is something better that we need to find. series in this post for easy reference. your inbox daily, you can sign up below. 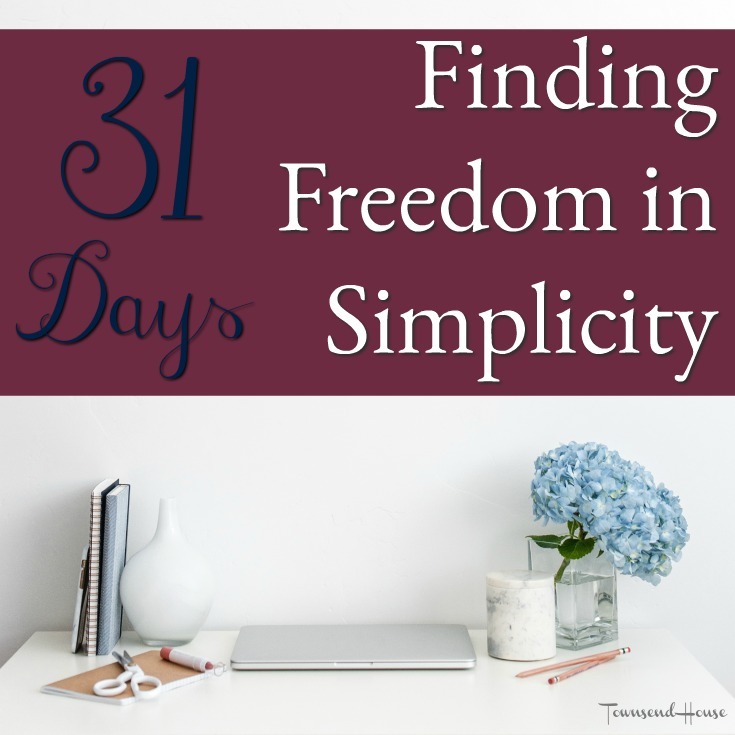 Welcome to 31 Days of Finding Freedom in Simplicity! This series is something I love! I am so busy as a work from home mom! 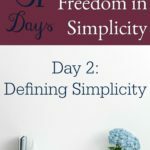 Simplifying would be great step for me! I would travel, read, or create if I had more time. I would spend more time with friends and family. I would hopefully remember to enjoy the moment. I will be reading more of your posts in this series. I love more freedom to just enjoy life instead of always having to rush around. Sometimes you just need a day or two to do nothing or to read, or go exploring. My days are long but I'm so appreciative for every work contract that comes my way. I was home with my oldest daughter and for the longest time felt guilty about not being able to give that same experience to my youngest. 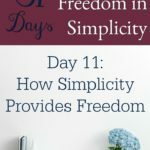 Although it feels like it's not possible, I definitely need to slow down and simplify. 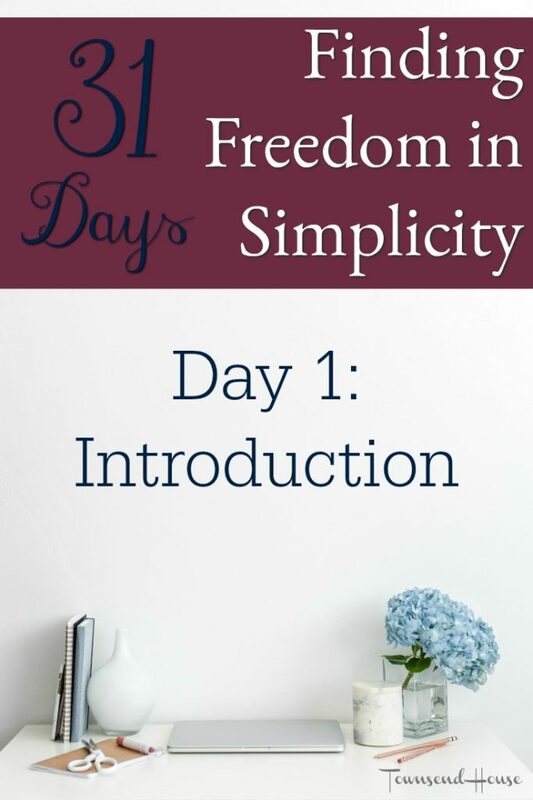 Embracing the concept of simplicity is a really good idea! I really like the concept of this series! Sometimes when we are too busy we forget to take breaks that could help us greatly. 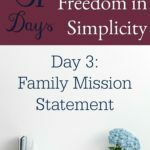 This is such an amazing series and totally agree with living the simple life. Yes, Yes, and Yes. I am torturing myself these days, and I know it's because I am trapped in my head about things that I honestly cannot change. Live simple. I just love this thought. Living a simple life is something I really enjoy to do. I'm interested to see what else this month's series will bring! I love freedom and simplicity. I'm definitely in the stage of life of chaos, but all essential chaos, so I'm not sure what I would cut out. This is such a good topic! I'm a huge fan of simplicity and the freedom it brings. I definitely need to work on simplifying my life. I think that is going to be one of my goals for next year. What a great series sometimes the simple things are the best things. This is a great series. I don't know what all it will entail but I do know that things need to get paired down in life. I think I would love this series! Sign me up girl! Can't wait to hear what you are going to say next! It is so true. When I moved earlier this year, I took a very minimalistic approach to life, my closet, my decoration and just everything. I feel like the more I let go off everything the more relaxed I feel. I spend less time worrying about things that before would drive me crazy. It's good to slow down a bit and just take a breather among the busyness of life. I think it's really important that we find this kind of freedom. What is this freedom you speak of? Lol. My husband finishes grad school in December and we are concerned we won't know what to do with ourselves when 2018 rolls around. When I think of my childhood, I fondly remember what it was like to live only for the moment. I didn't stress out about tomorrow. I just thought about now. And I'd love to have more moments like that as an adult. I've been meditating quite a bit lately and find that to be super helpful. I've recently embraced the concept of simplicity and it's so freeing. I constantly fight the urge to over-commit and go 100 MPS, but am learning the value of taking time to slow down and enjoy the good life. It really is a refreshing change. This is great! 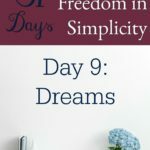 I do wish for more freedom to do my passions such as cooking, baking and mostly writing! I know ME time is important so I try to squeeze it in before bedtime for the kiddos. I am in a constant state of go. Like today..i got up, started working while drinking my coffee…my daughter got up, fixed her breakfast…went back to working…started homeschooling…still working while she is doing her lessons…took a break to fold and put away laundry…went back to working, while eating lunch…constant state of go. I need to slow down! I really do worry about what other people think…and that DOES weigh me down. I need to let go of some of that crap.